The French are very proud of their culture and cultural heritage. Indeed, since the earliest times – through their art, architecture, music, and literature – they have played a pivotal role in the development of ‘western culture’. One such iconic treasure created in France is the Les Belles Heures du Duc de Berry, perhaps one of the most famous Book of Hours in the world. Dutch painters Herman, John and Paul Limbourg were commissioned by John of Berry (1340-1416), a superb patron of the arts, to create this beautiful work. It was completed by another artist and Jean Colombe in 1485. The manuscript is now in The Cloisters library in New York. 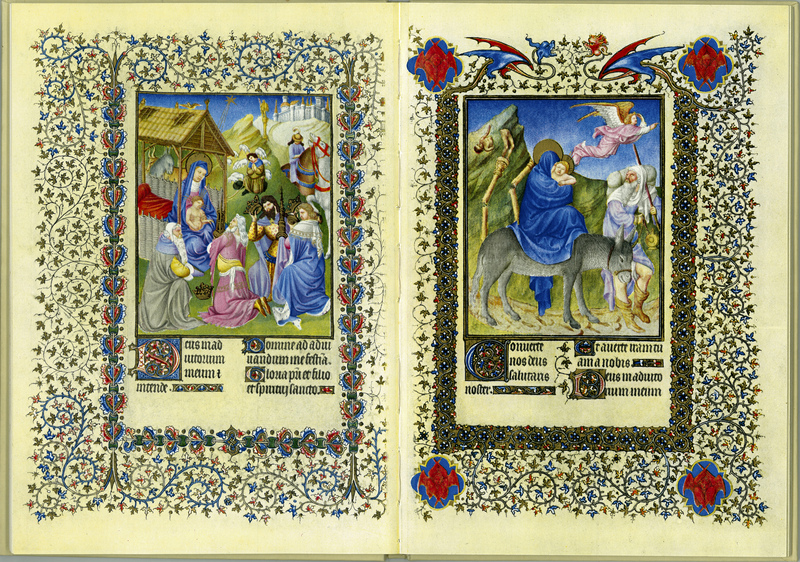 Just two of the 94 full-page illuminations are on display: the ‘Adoration of the Magi’ and ‘Flight into Egypt’. [Jean Colombe], “Les Belles Heures de Duc de Berry,” ourheritage.ac.nz | OUR Heritage, accessed April 26, 2019, http://ourheritage.ac.nz/items/show/10640.